Okra is one of those veggies you either love it or not. I LOVE okra! Gimme okra fried, baked, in soups and stews – it’s just good stuff. My favorite would have to be breaded. However, breaded takes on a new meaning when it comes to Paleo. After the Paleo movement, one thing I missed was breaded fried okra. Once the craving could be denied no longer, I picked up some fresh okra and was determined to make it without using anything to coat it. Flour-less fried okra. Gluten-free okra. The results? Not. so. bad. I sliced them lengthwise, added salt and pepper and fried in avocado oil. Much to my surprise, it was not the slime pit I anticipated. The sad part is, once they were cooked and drained, they were consumed before I thought to take a picture of the finished product! Well, that’s what cravings do – it sets you on a one track mind until the goal has been accomplished, and you’re full. I have tried using almond flour and coconut flour but cannot keep the flour to stick to the okra while cooking. I’ve tried the flour alone and making a batter with eggs – still to no avail. If anyone has a solution, would love it if you’d share! 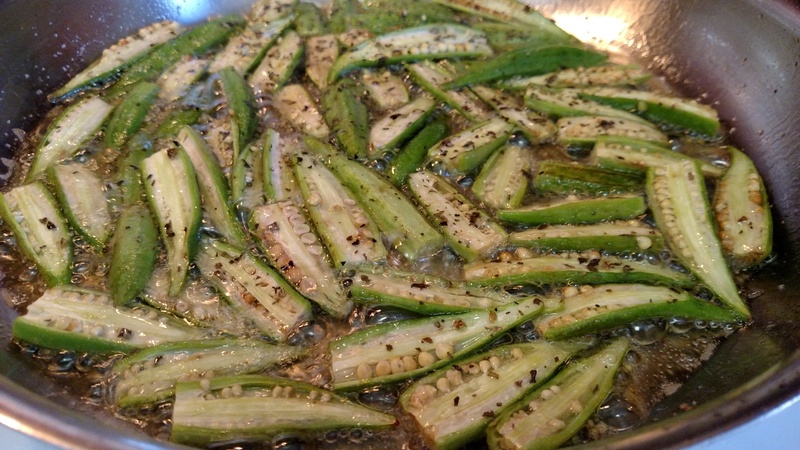 Okra lovers, add your spices and fry away! You’ll still get your okra fix and it will be a healthy one to boot!